As the defenses of the small intestine begin to break down, yeasts like Candida begin to feed on the cells of the intestine. 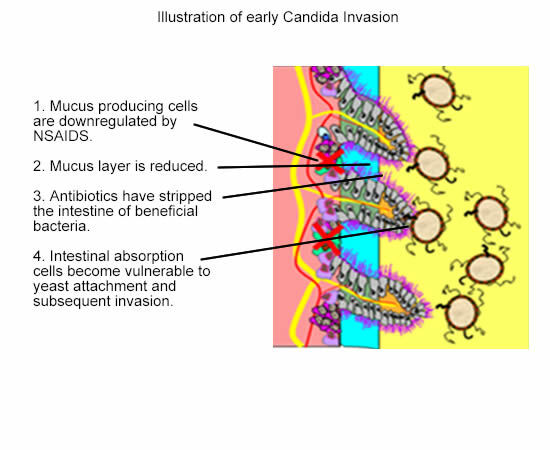 This can take place because the mucus layer has been thinned (usually by taking an NSAID) and the protective layer of friendly bacteria have been eliminated (mostly attributable to having taken an antibiotic). The contents of this web site are intended for educational purposes only and are not meant to be diagnostic nor prescriptive. If there is any question about the safety of the suggestions, they must be discussed with a health professional.